We love our dogs, especially if they are there to serve as our emotional support dog partners. But, we do need to always be sure we are taking care of our pet because diseases like babesiosis can creep up on our furry friend at any second. This fatal disease transmitted by ticks and affects mammals. It causes severe anaemia in dogs – cats aren’t at risk and neither are we humans as Babesia canis parasites only infect dogs. According to the Centers for Disease Control and Prevention, babesiosis itself is located in the northeastern and upper midwestern United States in areas where Babesia microti is endemic. Fortunately, it has not yet been reported in domestic cats in the USA. If your dog becomes weak and lethargic, has jaundice or pale gums, fever and red/blood colored urine, take them to the veterinarian as soon as possible. 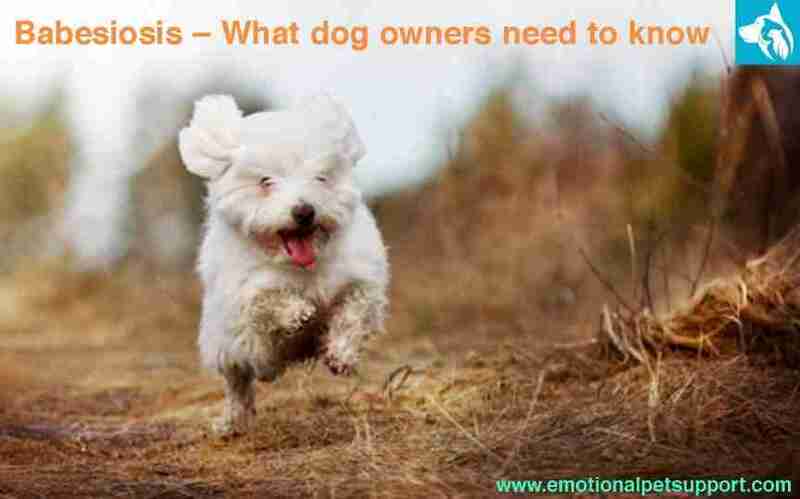 If there is a suspicion of babesiosis, the vet can do a blood test to diagnose the disease. According to Healthy Pets, the incubation period is roughly two weeks before the dog starts developing symptoms. Treatment includes medicine to reduce the parasite load and stop the dog’s own immune system from destroying its red blood cells. Make sure you check your dog daily, particularly after each walk and if you do spot a tick, don’t panic. Ticks can be removed safely using a tick hook. If you’re concerned about removing them yourself, ask your veterinarian for advice. Use an appropriate tick product. Apply the treatment once a month, throughout the year for continuous tick and flea protection. It doesn’t stop ticks from attaching but it kills them within 48 hours of contact with your treated pet, helping to minimize the risk of tick-borne disease transmission. A single female tick can lay up to 10,000 eggs! Ticks locate a host by detecting breath (CO2) and body odor, as well as heat, vibrations and shadows. Ticks do not have wings to fly and can’t jump. They walk on the ground and up plants where they search for a host. Ticks have a specialized saliva which numbs the bite area, prevents inflammation, and keeps the blood flowing on their victim so that they can continue to feed for prolonged periods of time. Ticks can be active at temperatures as low as 3.5°C! They use plant debris (fallen leaves, branches and rotting vegetation) to shelter themselves during the cold weather. Ticks are pretty tough! They can survive being frozen, have been found at altitudes of 2000 meters and even survive going through the washing machine at 40ᵒC!